The list of countries, states, cities and towns that have announced ambitious plans to go 100% renewable continues to grow. The latest entrant is Spain, which according to the Guardian plans to switch to 100% renewable electricity by 2050 and aims to fully decarbonize the country’s economy shortly after. Evaluating the full decarbonization option is beyond the scope of a blog post, so here I give Spain the routine Energy Matters treatment to see whether it has any chance of converting its electricity sector to 100% renewables by 2050. A couple of observations to begin with. First, Spain’s plans are set forth in a draft Climate Change and Energy Transition Law that has yet to pass Congress. The recently installed Sánchez government has a shaky hold on power and will need support from other parties to make it official. But which politician these days can resist the magic catch-phrase “100% renewables”? Even Conservative MPs in the UK are now calling for it. Second, the data presented here are for the Spanish “Peninsula” – i.e. mainland – only. The Balearic and Canary Islands are ignored. NON-RENEWABLE ENERGIES: Includes pumped storage, nuclear, fuel/gas, combined cycle, cogeneration and renewable waste. RENEWABLE ENERGY: Includes hydro, hydro-wind, wind, solar photovoltaic, solar thermal, biogas, biomass, marine-hydro, geothermal and renewable waste. 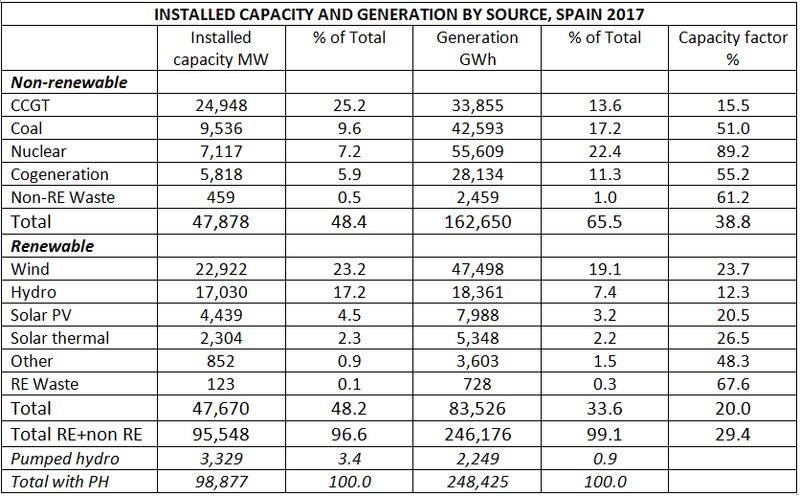 Segregating the results in accordance with these definitions shows that renewables supplied about a third of Spain’s electricity in 2017. It’s not clear whether distributed generation is included in REE’s numbers, but word searches for “distributed”, “embedded” and “rooftop” yielded zero hits. But by lunchtime Friday, the court had decided to suspend the ruling in light of the acute “economic and social impact” it was having — meaning the banks were in trouble! It’s impossible to tell just how much the total compensation bill would have come to, since stamp duty varies across Spain’s regions. As many as 8 million mortgage customers would have been affected by the court ruling, said the Spanish consumer association Adicae. Contagion from the recent surge in Italian yields has spread, and is hitting Spanish 10Y yields which over the past 3 days have blown out from 1.65% to as high as 1.82% this morning, before paring some of the move, printing at 1.77% last which is still the highest level since October 2017. There are also Spain-specific news that have pushed yields wider, to wit yesterday’s ruling by the nation’s Supreme Court they must pay a one-time tax of about 1% on mortgage loans that traditionally was passed to their clients. 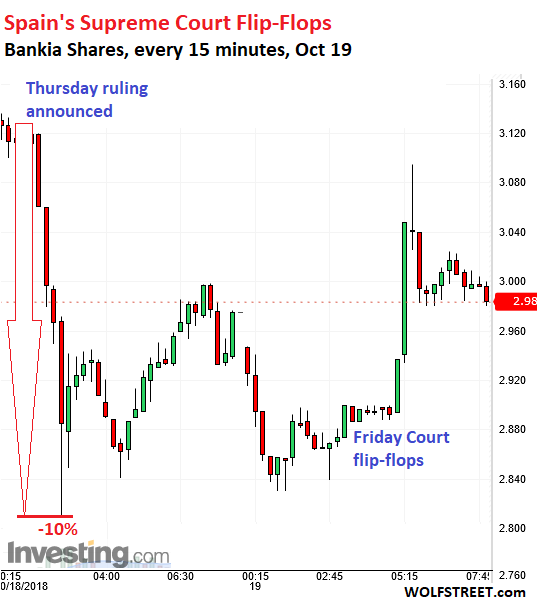 The report sent Spanish banks tumbling as much as 6.3% at Banco de Sabadell while banking giant BBVA dropped 1.8%, thanks to its larger international business that cushions the impact of the ruling. The Supreme Court revised an earlier ruling, deciding now that the levy on documenting mortgage loans must be paid by the lenders, and since mortgages are one of the biggest businesses for domestic banks, analysts have been grappling with how big the hit to income would be. As Bloomberg notes, the sentence is one of a string from Spanish and European Union courts in recent years in favor of home buyers and at the expense of banks. “The decision implies a severe setback for the Spanish financial system and joy for every mortgage-payer, who might get back a significant amount” of money, said Fernando Encinar, head of research at property website Idealista. In the short term, banks will likely raise their mortgage arrangement fees to compensate for their new cost, he said. The levy is applied to the mortgage guarantee – the loan amount plus possible foreclosure costs – and could be roughly 1,500 euros ($1,728) on a 180,000-euro loan in Madrid, according to Angel Mejias, an attorney at M de Santiago Abogados in the capital. In this case, the International Monetary Fund has once again warned Spain of the risk of reversing reforms and increasing imbalances. It asks to deepen in the labor reform to end structural unemployment and credible measures for the 2019 budget. The IMF is often criticized on many sides. It is often accused of being “neoliberal” despite the fact that in almost all its recommendations aim to prevent spending cuts. It is wrongly criticized, on many occasions, for being negative on countries. It is exactly the opposite. The IMF is often too diplomatic and, above all, undemanding with governments. A clearly diplomatic IMF has verified in its last report the important risks facing the Spanish economy. As growth slows down more quickly than expected, the risks that threaten the recovery have increased and many of the socialist government’s announcements could be counterproductive and accelerate a relapse. In a very diplomatic but forceful way, the IMF warns about the governments’ optimistic and inflated estimates of tax revenues. No wonder, because the average error in revenue estimates for new taxes in Spain is very important, an average of 5.8 billion euro annually. Inflated estimates are an easy trick to square budgets. Making impossible estimates of tax revenue while spending increases are very real. Then, when deficits soar, blame an external enemy. The graph below shows the historical overestimation of tax revenues (5.8 billion euro per annum more tax revenues estimated than actually collected). The Spanish Treasury Inspectors themselves have warned: “It would also be very interesting that those who speak again and again of these striking figures will provide the studies on which they are based to compare them. From previous unsubstantiated studies, inadequate and impossible proposals arise”(Tax Inspectors, January 2015). Banks are curtailing “cash services.” But why? Banks in Spain are are also shutting down many of their ATMs. In 2017, the biggest lenders withdrew over 1,100 cash machines — around 3% of the national total. BBVA, Spain’s second biggest lender mothballed 192 ATMs (2.9% of its total stock) last year; Bankia, 301 (4.8%); Caixabank, 47 (0.5%), and Banco Sabadell 541 cash machines, the equivalent of 15% of its total stock. This is all happening at a time when banks in Spain are making it more and more difficult to access cash from the branches that remain open. As we previously reported, Spain’s third largest lender, CaixaBank, last year launched a pilot project in Madrid aimed at limiting cash services in their branches to less than three hours a day, from 8:15 am to 11 am. LA JUNQUERA, Spain ― In this sparsely populated region of rural Murcia in southern Spain, fields of thirsty almond trees eek sustenance out of the dusty soil and pale rocks tumble down slopes onto the sides of the road. Successive years of low rainfall have led to serious issues with water security, and some locals say increasingly mechanized farming has been detrimental to the land. This is agricultural country, but it’s clear that these are not fertile plains. Scan the horizon quickly and you might not notice it the first time. But near a dip in the valley, something unusual is happening. Colorful yurts, compost toilets and an outdoor kitchen dot the landscape. It’s only a 12-acre plot, but it stands in stark contrast to its arid surroundings. Several species of green plants and colorful wildflowers cover the ground, and vegetable patches grow mustard leaf, spinach and broccoli. In the ponds, tadpoles swim in the shallows, and a trotter print in the mud nearby indicates a wild boar has recently stopped by for a drink. Young apple trees are blossoming, and people are digging trenches and planting potatoes. This is Camp Altiplano, where volunteers are using simple practices such as creating ponds and loosening hard earth to return the soil to health. “When the first tractors arrived [in the 1950s and 60s], that was a big moment for the degradation here,” says Alfonso Chico de Guzman, who owns the plot of land where Camp Altiplano is located. With machinery, most farms increased their amount of productive land by cutting down trees and shrubs, which are vital for healthy soil, the farmer says. Europe’s many fault lines are spreading once again, bringing the endless euro crisis saga back in 3-D realism. Italy gained a new anti-establishment government last week, even as Spain elected a new Socialista government that could crack Catalonia off from the rest of Spain. All of Europe fell under Trumpian trade-war sanctions and threatened their own retaliation. And Germany’s most titanic bank got downgraded to the bottom of the junk-bond B-bin. Deutsche Bank appears to be leading the way into a full blown euro crisis like Lehman Bros did in the US financial crisis. In one week, Europe with its impossible euromess moved back into position of being the world’s chief menace. The Eurozone is a house of cards with many exits, each with their own name, as I’ve written about frequently in the past, and it’s time to pay the never-ending euro crisis some attention once again. As was widely expected, this morning Mariano Rajoy’s six year reign as Spain’s prime minister, ended when he become the first prime minister in Spain’s democratic history to be ousted by parliament after losing a vote of no-confidence amid a corruption scandal engulfing his Popular party. He will be replaced by the Socialist opposition leader Pedro Sánchez. A small but sufficient majority of Spanish lawmakers was sufficient to end Rajoy’s career, voting 180 to 169 to remove the prime minister, cutting short the second term of one of Europe’s longest-serving leaders currently in power. The center-left Socialist Party had called the no-confidence vote last week and proposed its leader to replace Mr. Rajoy. Mr Rajoy spent eight hours in a Madrid restaurant on Thursday afternoon instead of sitting through the first part of the parliamentary debate, but appeared composed on Friday during his resignation speech. Socialist Party leader Pedro Sánchez, who becomes prime minister immediately, told lawmakers that his policy goals include bolstering social policies to address problems such as unemployment and poverty levels, both of which remain high despite Spain’s strong growth. Among Sanchez’ challenges will be managing the eurozone’s fourth-largest economy and dealing with internal problems such as the crisis in Catalonia. Political risk in Europe was largely ignored in international markets because of the mirage of the so-called “Macron effect”. The ECB’s massive quantitative easing program and a perception that everything was different this time in Europe added to the illusion of growth and stability. Now, the new government wants to solve a problem of high government intervention with more government intervention. The measures outlined would imply an additional deficit of some €130bn by 2020 and shoot the 2020 Deficit/GDP to 8%, according to Fidentiis. Italy’s large debt and non-performing loans can create a much bigger problem than Greece for the EU. Because this time, the ECB has no tools to manage it. With liquidity at all-time highs and bond yields at all-time lows, there is nothing that can be done from a monetary policy perspective to contain a political crisis.